Her lawyer claimed that by republishing this information that I am liable for damages caused by the harm to her reputation. In my opinion, she’s blemished her reputation all on her own (but I’ll let you read the letter for yourself). To make it easy on everyone – I’ve also linked to my original post, which was a quote from Mr. Shepherd, who stands by his story. I think my statements are fair, accurate criticism, particularly given the known facts of the case. Now, the last thing I want to do is report something erroneously. After all, I stake my reputation on my honesty and integrity, so if I have made a mistake – I will freely admit it – and will happy display it in ALL CAPS here on the blog. Not only that, but I will happily travel out to see Dr. Crute and interview her for the blog, so she can set the record straight – if it needs correcting. But I can’t be cowed by an angry surgeon looking for an easy target. Notably, the lawyer’s letter doesn’t even address the accuracy of the claims against her. But I did see her own personal blog, where she has a one page statement addressing the charges, so I will link to it here. In it she claims to have been the victim of a one-person driven witch hunt. Yes, that could happen – but the breadth and width of the charges (hundreds) and the collaborating witnesses in the statements argues against it in this case. Now, the initial report to the medical board may very well have been the result of professional jealousies, or whatever, as Crute and her legal team claim. But there are so many charges – with multiple supporting witnesses that it seems highly unlikely. But it also may have also taken another neurosurgeon who was finally bold enough to speak up against repeated, repeated and repeated episodes of unprofessional, dangerous and injurous behaviors. In fact, a recent poll of 24,000 physicians demonstrates the reluctance of doctors to criticize their colleagues. The Medscape 2012 Ethical Dilemma Survey results showed that just 47% of physicians would caution a patient about a colleague they felt was practicing ‘substandard’ medicine. While her statement makes it sound like these sort of complaints against providers and surgeons are common – they really aren’t. While it may seem so for Dr. Crute (and neurosurgeons do have a high rate of malpractice), for another colleague, several nurses and the surgeon’s own PA to make these statements about Dr. Crute to a medical board means that it was more that a personality conflict. Not having her license stripped away is not proof of innocence. In most states, medical boards offer disgraced physicians the opportunity to inactivate their licenses. It’s similar to hospitals (and other organizations) allowing doctors, CEOs and such, to resign instead of being fired outright. This practice has been clearly established and well-documented in several notable cases. 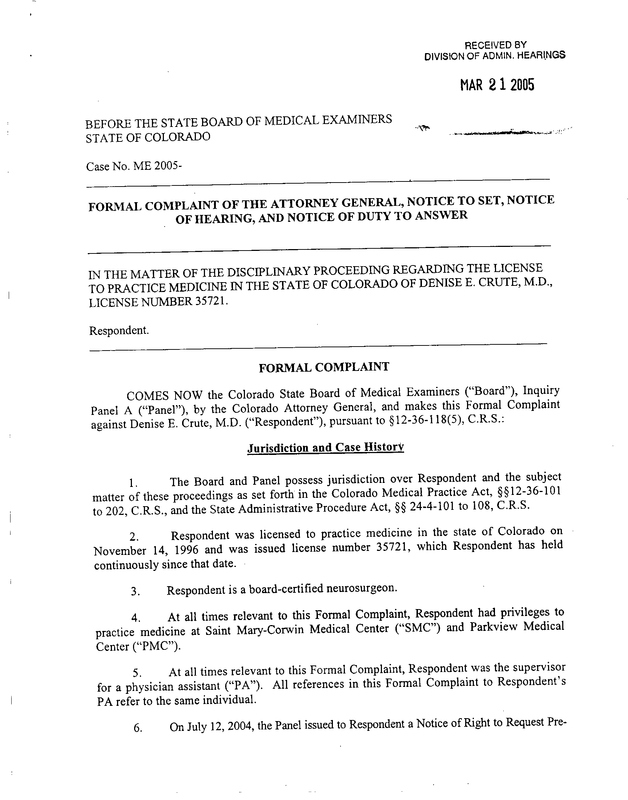 In fact, many say that the recent stories about Dr. Crute (by Denver reporter, Ferrugia) have prompted changes in the licensure and disciplinary processes at the Colorado Medical Board. But it’s more than that – attacking my blog for using well-publicized and reprinted information (available at multiple sources) to illustrate a discussion here on patient safety, just seems to me like bullying, especially when there are twenty other articles about Dr. Crute on much larger websites with a lot more viewers. So I also contacted Mr. Ferrugia and Mr. Shepherd (of News of the Weird) to see if they, too, had been contacted by Dr. Crute and her legal team. No, they haven’t.. Just me. This makes me suspect that this entire letter/ episode is just an attempt to bully someone smaller and less powerful, and that’s what makes me angry. This would have been a good opportunity for Dr. Crute to rectify the record, if that’s truly the case (especially since legal action and media coverage appears to have ramped up in the last few days with more and more articles over the last week) but she doesn’t appear interested in that. (If she had, we would be seeing retractions from the other writers involved). But – check out her site, read her defense, and let me know what you think. It is also worth noting that despite all the ‘glowing’ quotes she has on her website, she doesn’t appear to be operating on patients in her new position. I’m not sure that the fact that she volunteers or donates supplies to Central America holds any relevance to the discussion – but she put it out there, so I’m reporting it. In the meantime, I stand by my statements in reference to safety checklists, etc. that a ‘time-out’ for patient safety can prevent many of these errors that are documented in the original papers, such as in 2004 when she performed wrong-sided brain surgery – which she is accused of, along with then attempting to cover-up in her documentation (and actually had the gall to say that the patient “marked” the wrong-side.) The patient had a right subdural hematoma (and according to the notes on page 7 of attached document) – was in no condition to consent/mark or otherwise make any medical decisions. Read the original documents – and see if it paints a portrait of someone who did whatever she wanted, when she wanted and thought that she could get away with it – like when she failed to come see an emergency surgical consult at night*. She gave a telephone order for intubation, and still didn’t bother to come see this critically injured patient. Then, after it was too late – came by at 7 am in the morning, and back-dated her notes. (Yes, patient died). Unfortunately, there is no checklist to address such an ethical lapse. But in the spirit of honesty and integrity, and in pursuit of the truth, I have contacted the reporter of the original story, John Ferrugia to see if there have been any story updates, retractions or corrections. (Mr. Ferrugia also provided the supporting documents.) I also offer Dr. Crute the opportunity to give a statement here. She knows how to contact me, and apparently she’s reading the blog. But – this isn’t what my blog is really about – so we will get back to our regular topics, like surgical checklists and surgical apgar scoring – on our next post..
* Just one of many incidents documented in the original documents. This entry was posted in neurosurgery, Quality Control/ Medical Standards and tagged Colorado Medical board changes regulations, Colorado surgeon flees medical board, intimidation, malpractice, medscape ethical dilemma survey results 2012, Neurosurgery, patient safety, safety checklists, wrong sided surgery. Bookmark the permalink. You are doing the correct thing. Don’t be intimidated. Crute has flooded the Internet with self promotion sites (just do a google search on denise crute) filled with laudatory crap obviously written by her, a family member, or someone being paid to remake her reputation. Your points are well taken, and she has a typical “me against the world” attitude that is characteristic of narcissists with huge egos. After all these years, the woman still has no insight into what she has done wrong, how she has harmed patients, and still believes that all that has happened is someone elses fault. Crute is the epitome of the doctor type she rales against—the prototypical arrogant, God like, know it all male surgeon. She is the female equivalent of that and just can’t see it. The woman is trying to reinvent herself after a failed career as a neurosurgeon. I worked with her in Colorado. She has no insight. She is arrogant and thinks that she does no wrong. We are all just mere earthlings and can’t hope to understand such a brilliant renaissance woman. It is all our fault. I hope New York comes to realize that she should not have been granted a license. She ought to schilling her mediocre art on the Internet. If you would be willing to provide more comments – please email me at k.eckland@gmail.com. As you’ve seen, her lawyer is continuing to threaten me with lawsuits. Kudos to you John, I am still suffering 15 years later; she did surgery on me in 2001. Where is the justice in the medical industry. Lost my lawsuit against her. Go figure!